I’ve decided to create this page as it seems the VCAP5 exams aren’t going to be out before the grace period for people with the VCP4 accreditation not needing to take the What’s New course expires. So like with my VCAP4 and VCAP5 pages I’m planning on listing all the resources I plan to use and great study resources i come across that may help other people of varying degrees of expertise prepare for the exam. If you don’t know already the VCP5 has been released and I know a fair amount of fellow VMware professionals who have already passed it and every single one of them has said that the VCP5 requires you to have a certain amount of hands on experience so my first learning source is to build yourself a home lab and install a free copy/trial copy of vSphere 5 and play around with every single bit you can. I already have a home lab which i used for my VCAP4-DCA exam preparations and will be upgrading it to vSphere5 and trying out all the new technologies. As mentioned above if you have just started with VMware or have your VCP2 then you will need to attend the VMware vSphere: Install, Configure, Manage [V5.0] course. There are already a large amount of classes running for this course around the world and having spoken to a few people who have attended it they have said it is a very very good course. The only way to pass the exam in my opinion is to download the VCP5 Exam Blueprint and go through it and tick off every single thing in it once you know how it works and what it does. This was the best way to know you are ready for the VCP4 and I know it is for the VCP5 also. So download it and make sure you know absolutely EVERYTHING in it. Yet again Simon Long has done his practice exams and having tried them they are really good at giving you a good idea of your knowledge of some of the new technologies and are also great practice for the exams. Seeing as I got a few people commenting on my VCP4 Study resources posting stating the obvious I thought I may as well state the obvious that these are not the real questions from the exam as that would be cheating. One of my favourite study resources that helped me for my VCP4 and VCAP4 studying is the Transignal videos. David Davis and Elias Khnaser have released their vSphere 5 edition of the videos and having had a brief overlook of them already they look as brilliant as ever. Personally I think this is a must have to be able to pass the VCP5 exam and is one I will be using extensively. Andrea Mauro (Andre the Giant on the VMware Communities) has done some amazing study guides for all the things you will need to know for the exam. I’ve spoken to a few people who have passed the VCP5 and they said they used his study guides and it helped them massively and the passed do to the usage (among extra resources of course) All his guides can be found here: http://vinfrastructure.it/certifications-on-virtualization/vcp/vcp5/. As mentioned in my VCAP5 resources page, one of the best resources in my studying for my VCP4 was Scott Lowe’s Mastering VMware vSphere 4 book. Scott’s Mastering VMware vSphere 5 book is now available in both the US and the rest of the world via Amazon in both paperback and kindle versions. I was fortunate enough to win a signed copy at VMworld Europe and have already started browsing through it and yet again it looks amazing. Simon Greaves has done a brilliant series of postings all about new features in vSphere 5 and what he believes you should know to prepare for your VCP5. Part 1 ,Part 2 and Part 3 have all been posted and give some great tips and resources about vSphere 5. 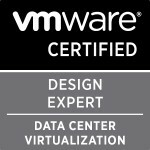 Scott Vessey of vmwaretraining.blogspot.com fame and a fellow London VMUG attendee recently passed his VCP5 exam and has given some brilliant insight into the format of the exam and what to expect in his posting here. He has also done a great resources page here all about the VCP5 exam. Congrats on the pass Scott! Preetam Zare has done a brilliant blog surrounding the whole exam and all the objectives on the VCP 5 blueprint on his blog here: http://vcp5.wordpress.com . One of the things mentioned by Ray and one I was fortunate enough to even get signed at VMworld Europe (yes I’m seemingly that sad) is the vSphere 5 Clustering Technical Deepdive book by Duncan Epping and Frank Denneman. I was given a hard copy of the book but I might also buy myself a kindle version for ease of reading seeing as I have all my other books in Kindle format. There is a great series of postings on the VMware blogs site all about the new vSphere 5 Storage features and each posting focuses on a feature giving great detail of how it works and how to configure and manage it efficiently. I’ve already done all six and they really are a brilliant resource to learn about the new vSphere 5 storage features. It covers VMFS5,Storage vMotion, VAAI, Storage DRS initial placement, Storage DRS- Balance on space usage and Storage DRS – Balance On I/O Metrics . 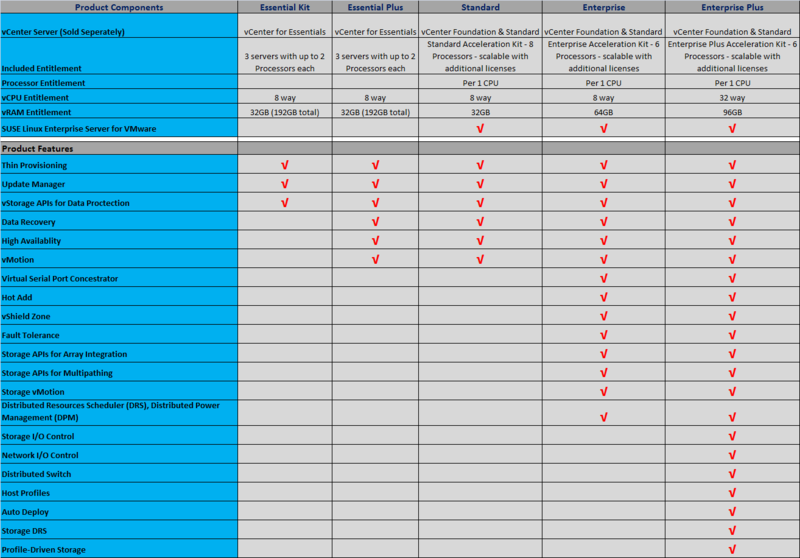 Knowing the varying editions of vSphere 5 and what you get with each is very important as knowing what features you get with each lets you decide on which one you want and with vRAM entitlements how many licences you need to purchase. The guys at MalaysiaVM have created a great graphic of the varying editions and what features you get with each. I used a graphic just like this prior to my VCP 4 and I was really glad I did as I got asked a few things about versions and what edition would I need for a certain feature. Thanks for the mention Gregg! Ahhhh Andrea i missed you somehow, I’ll add yours right away! Sadly, thanks to your mention, I paid for the Training Signals videos Their videos are “OK,” but nowhere near prep material for the exam, IMO. I feel like I blew 400 bucks, and for not a very good result. They are so high level with so little depth. It is a joke to me that they put “I passed the VCP with your help” quotes on that site. A real shame. Sorry to hear they weren’t that good for you. I guess it depends on what your previous experience is with VMware technologies as I’ve spoken to David Davis about the depth of the videos before and they have to create these videos to help people learn from the absolute basics to a certain level. The videos aren’t the only resource people need to use to learn about it. For me personally I have my VCP3 and VCP4 so these videos were perfect in teaching me the new stuff but I also read quite a few books and watched a few whats new webinars. Well people probably did pass with their help, it doesn’t say sole help but used with a few other resources they are very helpful. Out of interest what resources did you use for the exam? Same resources everyone is using: the Top 3 books on Amazon. Cosnock’s blog. The http://www.virtuallanger.com/vcp5/ resource. Practice tests that everyone says are too easy compared to the real deal. All go into a depth I didn’t find in those videos. To be fair, when I was ranting about their quotes, it wasn’t aimed at you. I just think that the link to their videos shouldn’t be under a “prepare for the VCP” article. They should be under a “if you’ve never used VMWare before” article. They are not bad, but try to take even an easy practice test after watching those vids. If you wanted to go into real depth David has done much more in depth trainsignal vids for the VCAP4 exams that I used for my VCAP5-DCA which should help you REALLY learn loads for the VCP5. The videos are good for beginners and when i was starting out on studies for VMware the trainsignal videos helped me build a solid base knowledge which is something obviously anyone even looking for the exam needs to do. I know you weren’t aiming it at me :). It’s hard to do a lot of these lists and i still try keep the lower end stuff listed as I’m working with high end VMware solutions daily so knowing how to enable DRS for example is simple for me but for someone starting out it might not be. The books you are reading are perfect and Jason Langer’s resources are brilliant as i even used his and josh Coen’s resources for my VCAP-DCA. The VMware practice test is a bit easier but it’s good to do it anyhow. Have you booked the exam again? I was booked for end of the month, but am considering booking it for first or second week in December now. I’ve also started reading Duncan Epping’s “Clustering Deep Dive” for 5.1. This isn’t so much for cert prep as it is the fact that we’re having HA issues at work, and I need to get a good understanding of what’s going on. Also, if you may please share your start to end routine of killing it daily. Thanks 🙂 Well this page covers what I think you should read and do to prepare for the exam. As for routine I never wrote it down, all I did was book the exam and then that forced me to focus and get through all the resources and be confident I could answer everything mentioned in the blueprint.